This is one of those titles that is always somewhere on the Top 100 Books To Read In Your Lifetime type lists, so I thought it would be beneficial to read it. 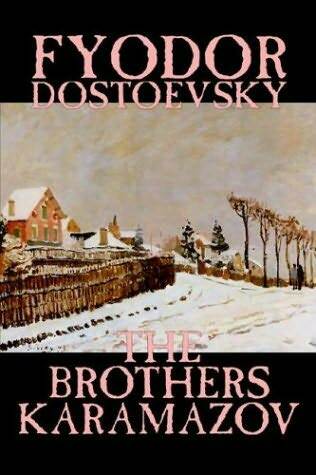 The Brothers Karamazov is about the 3 sons of Fyodor Pavlovich Karamazov, a truly horrible man who has almost no affection for his children or anyone else. The oldest, Dmitri (called Misha), is the only child by his mother, and lead a very indulged life which made him a very irresponsible and ridiculous adult. He is known for his heavy partying and drunken brawls, constantly coming to his father to ask for more money only to be cut off in a way he feels is cheating him out of his inheritance (clue: it isn't). Ivan is the middle child and oldest of his mother, his father's second wife, is the "learned" one - he's an atheist and aspires to travel the world and learn of other cultures. Alexei (Alyosha) is the youngest all around and second of his father's second wife - he is the religious one who joins a monastery under one of the reputed Great Elders of his time in hopes of becoming a monk. There is also one additional young man, Smerdyakov, who is a local orphan that everyone knows is actually the unrecognized son of Fyodor Pavlovich - he works as a sort of cook/ groundskeeper/ servant to his "father", though he is never acknowledged as his son. The first half of the book is all exposition to show the different characters and temperaments of those involved. All three sons were sent away and raised by other relatives, with little to know contact or care from their father in their entire childhoods. There is much description of the philandering of Dmitri and the religious path of Alyosha, as well as a debaucherous history of their father, Fyodor. The story really takes off when it gets to the main plot. Months before the brothers all come to live with their father in their twenties, Dmitri commits an awful moral crime. Dmitri meets a respectable girl, Katerina Ivanovna, and she snubs him. Later he finds out that her father is going to be in a huge financial predicament, owing his regiment thousands of rubles that he does not have, and Dmitri lets Katerina know before anyone else and tells her he will give her the money if she will sleep with him. She is shocked, of course, and runs off, only to find out he was right later that day. She comes back to him and takes him up on his offer, keeping things very secret. Eventually things for her father get better, and she returns the money to Dmitri, telling him she is in love with him and they become engaged. Dmitri basically decides that he does not want what he has already had, and falls in love with a local tavern girl, known as Grushenka, and blows all of his inheritance, plus a few thousand more that Katerina entrusted to him to deliver to her relatives, on a big drunken spree with Grushenka. He begs his father for the money, but he has been cut off, so Dmitri starts threatening to kill his father to take "what is rightfully his". The main reason his father denies him the money is that he, too, has the hots for Grushenka, and puts 3 thousand rubles in an envelope for her and hides it in his room, telling her that if she comes to him she can have this money. Long story short, Fyodor Pavlovich ends up dead with his skull bashed in. Everyone in the town heard Dmitri threaten his father, and everyone knew the drama that was going on, so when Dmitri is found with thousands of rubles on him having another drunken spree the night of the murder, he is arrested and put on trial for his father's death. The story line has a very modern feel to it, so I'm sure it must have been quite scandalous back in 1880 when it was first published. I found things a bit slow for about the first third of the book, but once it got going I was thoroughly stuck in. The story really examines lots of complex issues - what truly makes someone "a father"? How much can a persons character be held against them when they cannot help the way they were raised? At what point does circumstantial evidence become enough for a conviction? The trial itself read just like any trial scene of the time from any "Western" country in the world, which just feels strange given the state of Russia's government for the last 100 years. The lawyers really are very good, and present both sides to their advantage. I really loved the differences between the brothers and how they each show a different "life path" and where it can lead. In Dmitri's case, his constant self indulgence and lack of personal control lead to his ruin, while Alyosha's life is almost the complete opposite. I particularly loved the recollections of Father Zosima, the elder Alyosha follows, just before he dies. He tells the story of his life and how he was really not a good person in his youth and the way end became a monk. His story is all about finding happiness in spite of affliction. which I am a big believer in lately. Overall, I enjoyed the book very much, though it wasn't quite the "wow" I was expecting from its reputation. I do recommend the book to anyone interested in a good murder mystery and trial story. I give this book 4 out of 5 stars.